If you need a party snack, try these. They’re sprinkled with a spice blend that makes absolutely no sense but it’s a mix that’s sweet and spicy and gives these pastries a little something-something that’s completely unexpected. Position a rack in the lower third of the oven, and preheat the oven to 400 degrees F. Line a baking sheet with a Silpat® or parchment paper. Combine the Spice Blend ingredients in a small bowl. Set aside. To Make the Pastries: Unfold the pastry sheets on a lightly floured surface. Cut each pastry sheet into four (about 5-inch) squares. 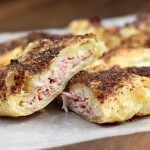 Place the ham and cheese on the centers of the pastry squares, dividing them evenly. 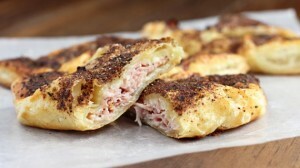 Sprinkle some of the Spice Blend lightly over the ham and cheese. Brush each pastry evenly with egg wash. Sprinkle them with more Spice Blend, to taste. Sprinkle sea salt evenly over the pastries. Bake for 12 to 14 minutes, until the pastries are golden brown. Remove the pastries from the baking sheet, and cool on a wire rack for 10 minutes. Serve warm or at room temperature.